Happy Sunday and Happy Birthday to The Queen. Are you celebrating this weekend? Love to hear if you are. My Sunday photo this week is a cake I made for the Queens 90th Birthday. A cake, how nice!? It took me hours to make and minutes to eat half of it!! Ha!! Not that I eat half myself!! I did share with my family. It was delicious. Everyone loved it. Not a crumb left, signs of a good cake, methinks. This weekend The Queen is celebrating her 90th Birthday. What a great reason to bake and eat a yummy cake!! I was set a challenge to recreate this ultimate Queen’s Birthday cake. Celebrate Her Majesty The Queen’s 90th Birthday with a right royal birthday cake knees up! You can find Her Majesty’s Birthday Cake Here. 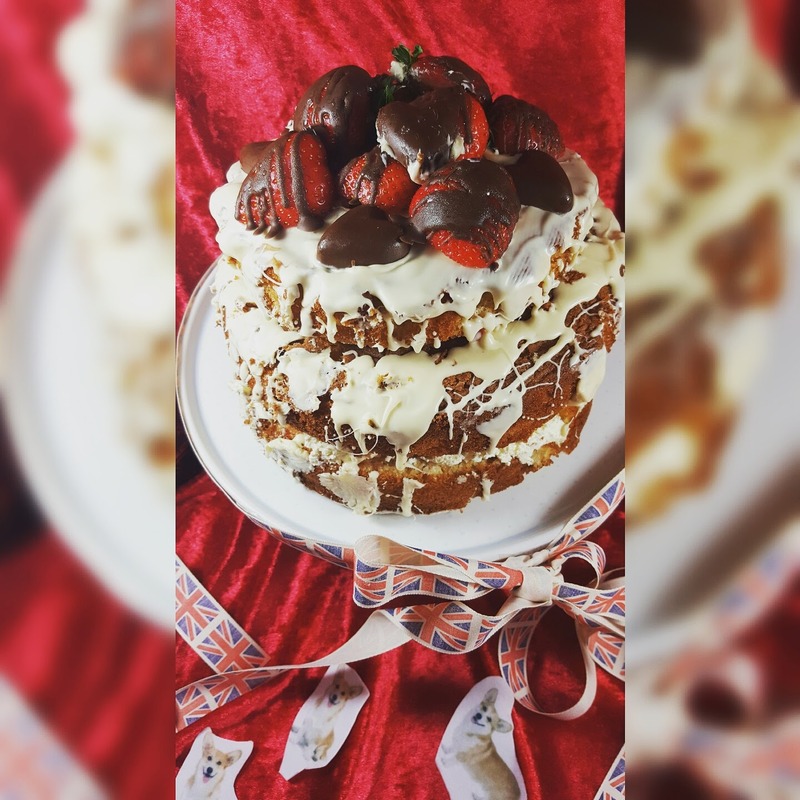 You can find my recipe here: Queens 90th Birthday Cake here. Victoria sponge cake layered up with yummy fresh cream, strawberries and drizzled in white chocolate. What is not to love about this recipe? 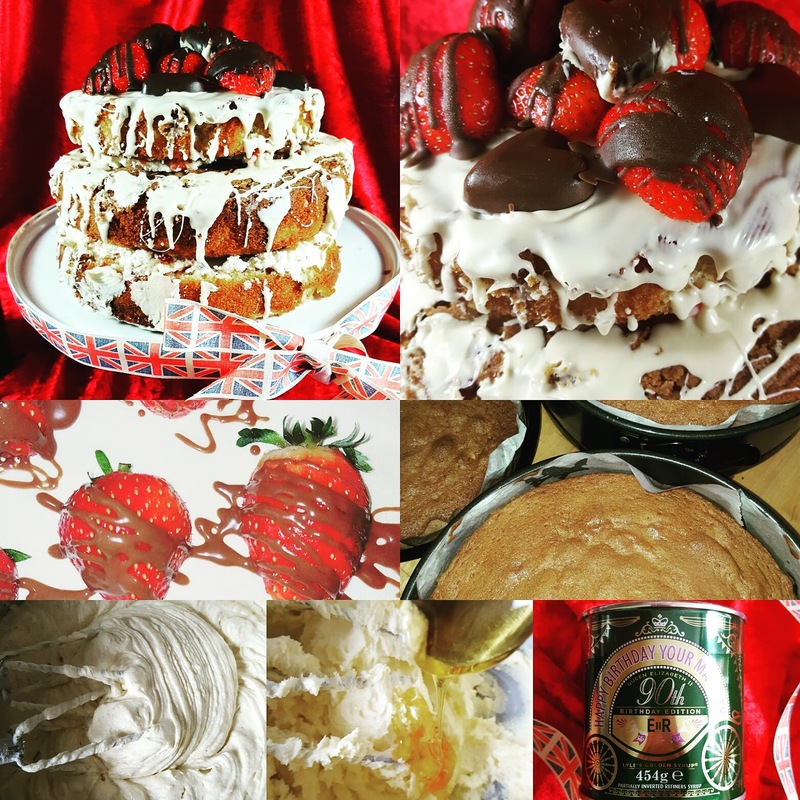 Fancy making my special Queen’s Birthday cake? Or trying a slice or two? Linking up with Photalife for My Sunday Photo today. How about you? Will you be joining in the photo fun too? If so, what photo are you sharing this week? Do not forget to stop by tomorrow for our Creative Mondays blog hop and share any of your yummy recipes with us. Also, share your photos with us on Wednesday for the wordless or not so wordless Wednesday blog hop. My Sunday Picture: I Just Love A Bit Of Cake Do you? "Up cycled China Cup Candle Holders…"
"Polka Dots, Rain, Sunglasses And Holidays…"
Hehe, I think it will be!! That looks simply amazing! And you've included one of my favourites, chocolate coated strawberries. My mouth is watering now. Thanks Anne, whoo I love chocolate strawberries too. So upset the rest of the pack went off so quickly! Aww, thanks Kim 🙂 Just had another piece for breakfast.. Happy birthday to HRH! Looks like a cake fit for a queen!